This is so basic, even a child understands it. We all use forks to eat meals, so we understand what a fork does for us. It gets things I want from point A (my plate) to point B (my mouth). Enough said, forks on a forklift do the same thing. Got it. So I need forks for my forklift to work properly. I get it, but once I buy a set with a new forklift, I am done, right? The forks on the forklift play a vital role with safe and proper handling of products. Manufacturers of forks for forklifts have developed a lot of options, capacities, sizes, and styles. An inspection of the application and use can help a professional determine the best match of forks to do the job properly and safely. 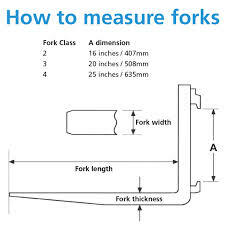 The most common specification on the forks are length, width, and height. These three specifications help determine the capacity, and the distance between the hanger brackets determine what carriage class the forks will work on in the field. What this means is that just because a set of forks will "attach" to a forklift, the capacity may be inadequate to safely handle the load. On Toyota forklifts, a base capacity forklift rated at 3,000 lb. has the same carriage classification (see inserted picture) as a 5,000 lb. capacity forklift. Some manufacturers use the same carriage class from 3,000 to 6,000 lb. capacity. This means the forks would physically fit and attach on either forklift, but could be rated for the wrong capacity. Additionally, heels of the forklifts can wear faster than other parts of the fork as the heels make floor contact most often. As the fork heel wears, the amount of weight those forks can safely carry is greatly reduced. 10% of wear on the heel reduces capacity by 20%. Since it is almost impossible to visually inspect for 10% wear, fork calipers are available to measure this critical component of stability and safety. The picture to the left here shows another common fork issue, damages from forks that are too long. ANSI and OSHA mandate that fork lengths are at least 75% of the product length. For example, a common pallet is 40"wide x 48" long, so the forks would need to be at least 36" long to meet the industry mandate. 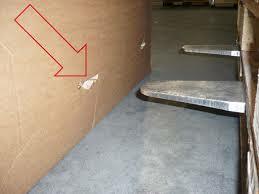 One of the most common lengths of forks is 42" long because this allows a "buffer zone" for safety, allowing for product overhang on the pallet, as well as driver error in not placing the load against the fork. Add to this, the options for standard taper, fully polished and tapered, round tip, block, brick, and fork extensions, proper specification is best left to a professional working with customers to determine the best alternatives and options. Something that seems so simple gets complicated when you consider the variables, options, and ever changing products handled in the field. If you are working then you should take some safety precaution and to know about precaution you have to do online safety training courses canada where you will know all about safety. Thanks for sharing the article on the forks. One should be safe and secure while working with the forks. Get the Retaliation in the Workplace Training where you will get to know how to handle these machines.